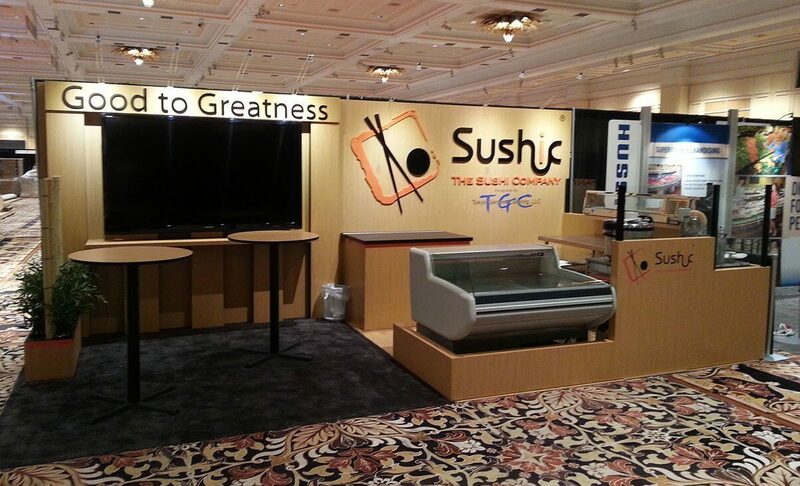 Tokyo Gardens Catering (Sushic) needed an exhibit to achieve their one and only vision: “to sell more sushi than anyone else, period.” Their goal at their first event was to introduce grocery retailers to their fresh and high quality products by creating a “restaurant” in their booth that would allow visitors to experience their sushi firsthand. Their technical requirements included: a prep area for their sushi wrap machine, a refrigerator, a chest freezer, a working sink, a wash station, and a Euro Deli self-service display. Exhibit Network’s booth design achieved the exhibitor’s goals and accommodated all the technical requirements while conveying their motto “Good to Greatness.” Because Tokyo Gardens Catering came to Exhibit Network late, the fabrication of the entire exhibit was completed in a 7-day period that included lots of on-the-spot engineering, remarkable teamwork by the entire Exhibit Network crew, and some personal sacrifice to work long hours to get the job done.